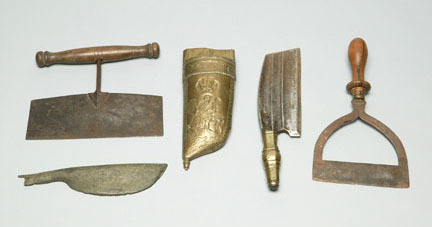 Numbering over 350 individual examples from Europe, Asia, Africa, and the Americas, and ranging from the early 16th to the 20th century CE, the Rietz collection of eating utensils illustrates the variety, history and development of the knife in the modern period. Knives are arguably one of the most important tools of the kitchen and dining room. Together with containers and fire, knives remain as necessary to a modern meal as they would have been centuries ago. Since most aspects of food preparation require their use, the story of the development of the knife is the story of cooking and eating. 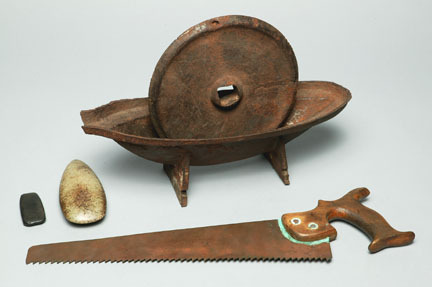 Rietz understood the knife's primacy in the technology of eating and cooking. CAS Photo/Dong Lin The knife selection in the Rietz Collection of Food Technology shows attention to the variety of uses to which these tools can be put. The collection includes kitchen knives, utility knives, carving knives, chopping knives, cleavers, cheese knives, fruit knives, scissors, folding knives, travel knives, bread knives, and daggers. In the pursuit of cross-cultural examples, Rietz collected knives from Western Europe, South, Central and East Asia, Oceania, Africa, and the Americas. 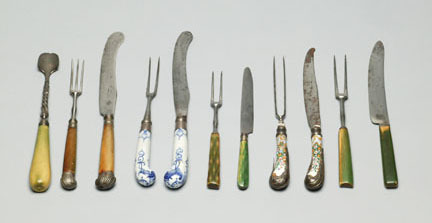 Included with the knife collection are examples of the historic development of the fork in the West and chopsticks from Asia. Grouped as a chronicle of the development of eating utensils that carry food to a diner's mouth, the Rietz Collection is one of only a handful of cutlery collections that clearly illustrates the evolution of tableware. Equally significant are the multiple examples of cutlery from major foundries and metal smiths, primarily in England and Germany, which are representative of the manufacturing processes of metal household goods during the Industrial Revolution. CAS Photo/Dong Lin The knife and cutlery collection is probably the most well understood area of the Rietz Collection. 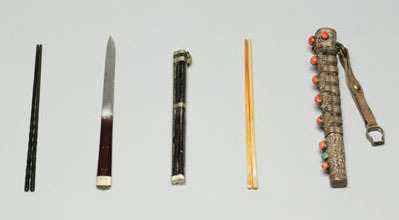 Examples of knives, forks and chopsticks have been exhibited frequently at the California Academy of Sciences and other institutions. The provenance for these objects is well documented and has been greatly enhanced through a collection survey conducted in 1982.